As ever, there’s a range of own-brand and third-party options to consider when investing in new glass, making it a bit of minefield to choose between them. There are some attractive options available, though, with third-party manufacturers such as Tokina offering a line of well-priced wide-angle zoom lenses in Nikon DX and FX, as well as Canon EF and EF-S formats. Chief among these is the 35mm-format Tokina 17-35mm f/4 and the APS-C format Tokina 12-28mm f/4, both of which have been achieving some interesting results in our industry standard lab tests. 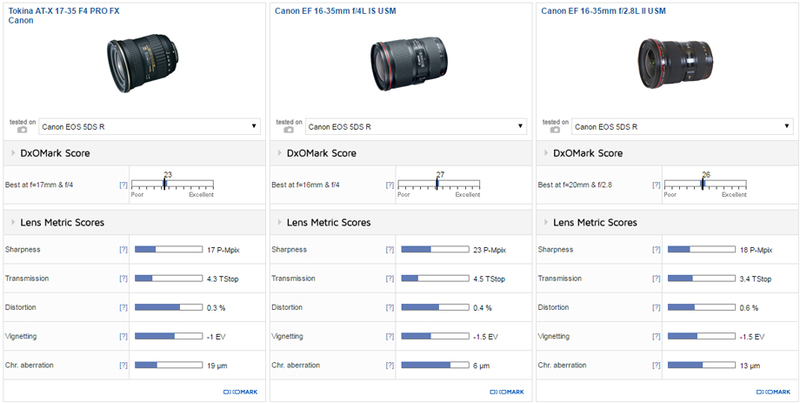 We’re delighted to bring you an in-depth analysis of all the lens metrics for these lenses in our comprehensive review. A full-frame 35mm option for both Canon and Nikon lens mounts, the $449 Tokina 17-35mm f/4 PRO FX is water-resistant (not waterproof) for pros working in challenging environments. The fixed f/4 aperture is respectable for shooting in low-light environments and helps keep the size and weight of this wide-angle zoom down compared to larger-aperture alternatives. It also employs Tokina’s “One-Touch Focus Clutch” mechanism to use the focus ring to switch between auto and manual focus. The best bit, however, is that at just $449, it’s significantly cheaper than many of the own-brand alternatives. 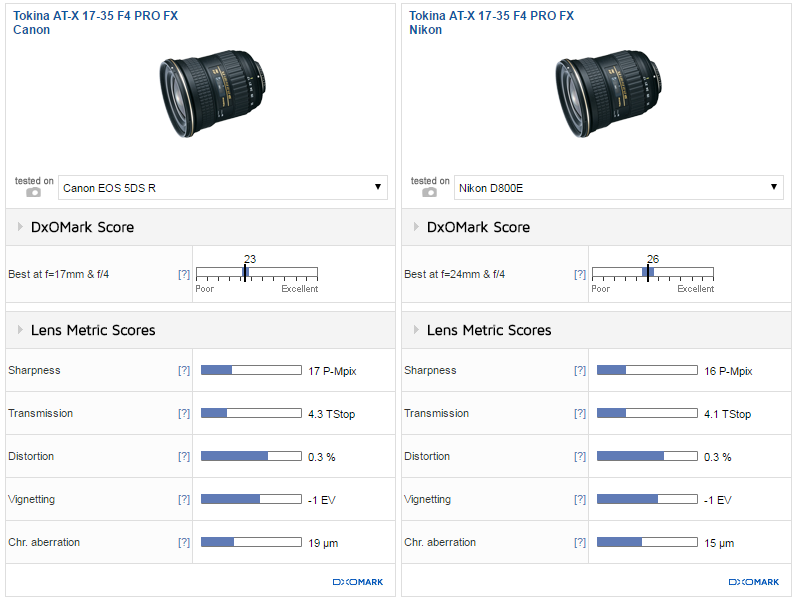 Tested on the Nikon D800E and the Canon 5DS R, the Tokina 17-35mm f/4 achieves similar scores across the board. 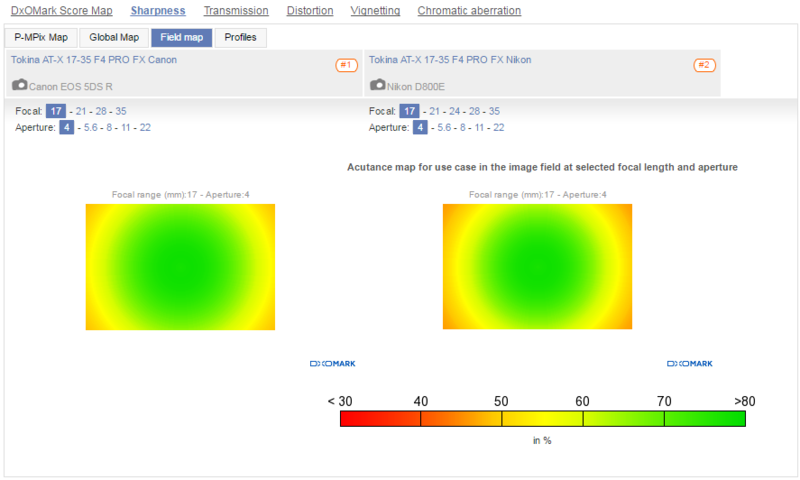 The Nikon version comes out slightly on top, however, with a DxOMark score of 26 points compared to 23 for the Canon. The Canon does have slightly improved overall sharpness of 17 P-Mpix compared to 16 P-Mpix for the Nikon, but considering that we tested the Canon on the higher-resolution 50Mp 5DS R, compared to the 36Mp Nikon D800E, the Nikon version gets more resolution out of the sensor. At the maximum f/4 aperture, the Nikon version offers good center sharpness at all focal lengths, and homogenous resolution around the middle of the range, with some edge softness at the widest 17mm and longest 35mm focal lengths. Close down to f/5.6, and sharpness improves in the outer field, particularly at the shortest focal length (which at that point is homogenous), and there’s a marked improvement at 35mm, too. At f/4, the Canon version isn’t quite as strong, due to softer results at 35mm f/4, although center sharpness is good between 17 and 28mm. Again, closing down to f/5.6 helps, although the Canon version offers something approaching uniform sharpness at 35mm only from f/8. 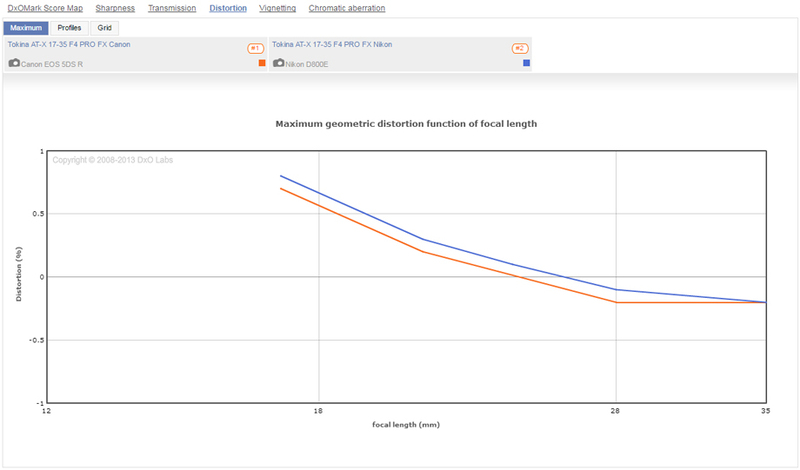 Both lenses have excellent distortion scores of just 0.3%, which is impressive for a wide-angle zoom and less than many more expensive competitors. 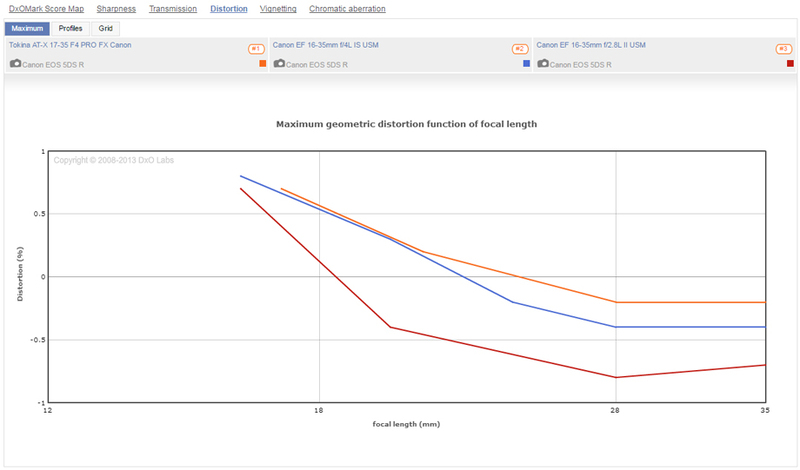 Barrel distortion at 17mm is noticeable as you’d expect, but still well-controlled, and between 21 and 35mm, the amount of visible curvature is negligible. The Nikon version offers brighter light transmission of 4 TStops at 17mm, which reduces to around 4.5 Tstop at 35mm, whereas the Canon version is a little more consistent across the focal range at 4.3 to 4.5 Tstop. This isn’t a big difference, however, and although brighter wide-angle zooms are available, the Tokina offers enough light for a good viewfinder image and responsive autofocus without the weight and bulk of a faster-aperture lens. The comparable third-party Tamron 15-30mm f/2.8 version offers additional features over the Tokina, such as image stabilization (VC) and a faster f/2.8 maximum aperture. At $1,199, it costs nearly three times as much, however, as does the equivalent $1,097 Nikon 16-35mm f/4G ED VR own-brand version, making the Tokina 17-35mm f/4 look like good value for the money. For sharpness, the Tamron is superior, however, with its best score of 24 P-Mpix recorded on the Nikon D800E — well ahead of the Tokina at 16 P-Mpix and the Nikon at 19 P-Mpix. The Tamron offers very strong and homogenous resolution at almost all settings and is notably sharper than the Nikon and Tokina versions at 30/35mm f/4. 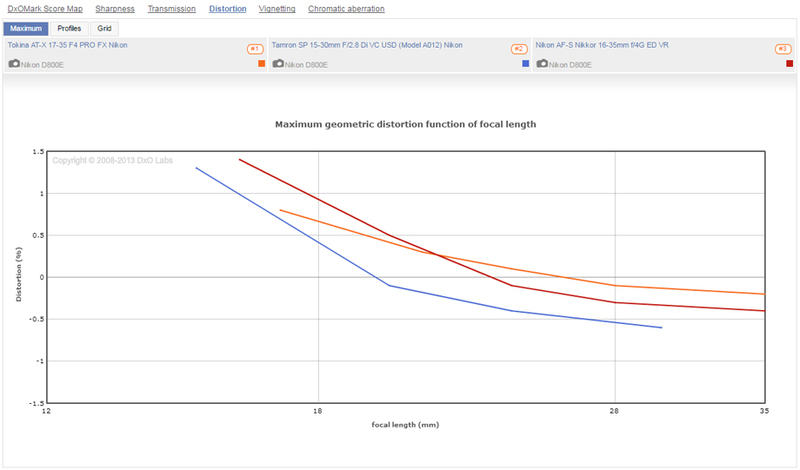 At the other end of the focal range, both the Nikon and Tamron versions offer greater resolution compared to the Tokina, which although good in the center of the frame, tails off in the outer field. 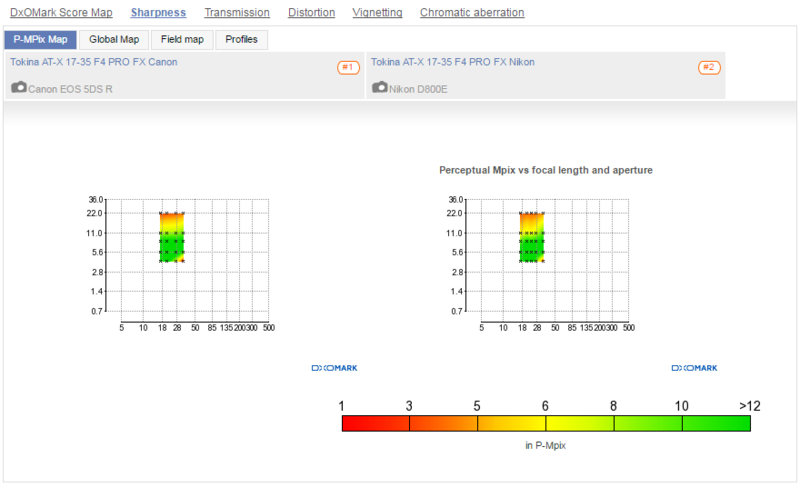 As you’d expect, all three lenses vignette fairly heavily at the wider focal lengths using the maximum apertures, as indicated by the red in the bottom left-hand corners of the global map. 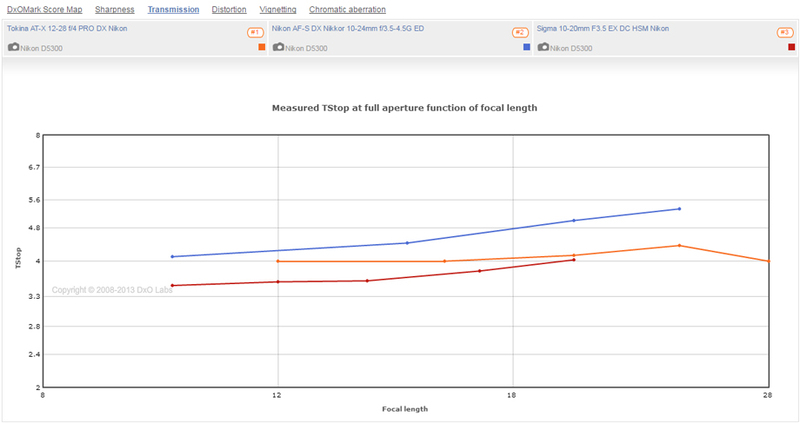 While vignetting continues to occur on the Nikon at all apertures up to around 20mm, both the Tokina and Tamron options handle it better between f/5.6 to f/22, as indicated by the green. It’s not quite the same story for chromatic aberration, however, where the large stripe of red for the Tokina 17-35mm f/4 indicates fringing at all apertures up to about 20mm. To be fair, this problematic fringing is restricted to the very corners of the frame, however, thus limiting the impact on your images. Canon has two own-brand wide-angle zoom lenses in their L series of professional-grade optics to go up against the Tokina EF 17-35mm f/4. Again, they’re both more expensive, with price tags of $1,049 for the image-stabilized EF 16-35mm f/4L IS USM and a chunkier $1,499 for the faster-aperture EF 16-35mm f/2.8L II USM. The Tokina lens offers a couple of advantages, with improved vignetting and distortion scores over the Canon equivalents, but it lags behind for sharpness and chromatic aberration, particularly compared to the EF 16-35 f/4L. With a sharpness score of 23 P-Mpix tested on the EOS 5DS R, the EF 16-35mm f/4L is far ahead of its rivals, offering strong homogenous resolution at almost all settings. In contrast, the EF 16-35mm f/2.8L version offers relatively poor outer field resolution at all focal lengths until you stop down to f/11. This more expensive Canon option doesn’t offer any significant benefit over the Tokina for sharpness, therefore, with the exception of the wider aperture settings where edge resolution is a little stronger (if not completely uniform). Distortion isn’t as strong on the f/2.8L version either, with both the Tokina and Canon f/4L featuring slightly improved curvature at both ends of the focal range. Where the EF 16-35mm f/2.8L does excel is transmission, where its extra stop of light will help bolster autofocus performance, particularly for press or event photographers needing snappy autofocus in low-light conditions. 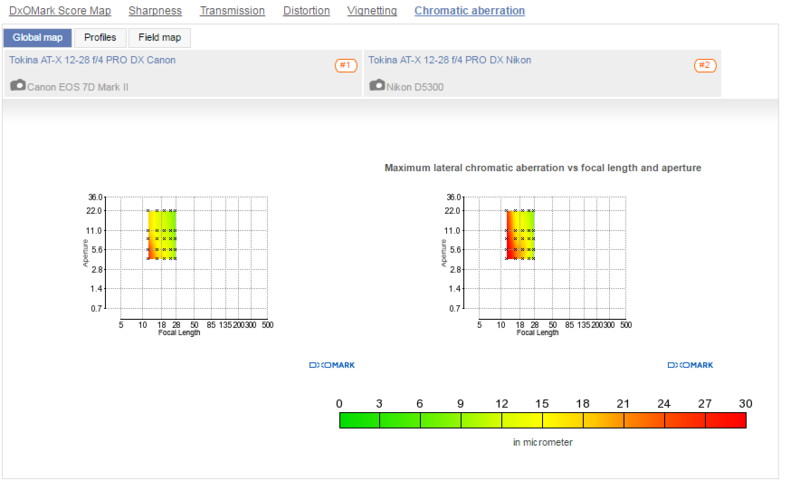 For crop sensor shooters, the DX/EF-S format Tokina 12-28mm f/4 PRO DX is the equivalent wide-angle zoom for Nikon and Canon APS-C. Equivalent to roughly 18–42mm on Nikon, and a slightly longer 19-45mm on Canon APS-C cameras, it doesn’t quite offer the same field of view as the full-frame version, but it’s not far off. Top-end features such as the weatherproofing seals and fixed fast aperture remain, as well as the “One-Touch Focus Clutch” mechanism for switching between AF and MF. There’s also a built-in SD-M autofocus motor and a GMR magnetic precision sensor promising quick and quiet autofocus on all Nikon / Canon APS-C bodies. 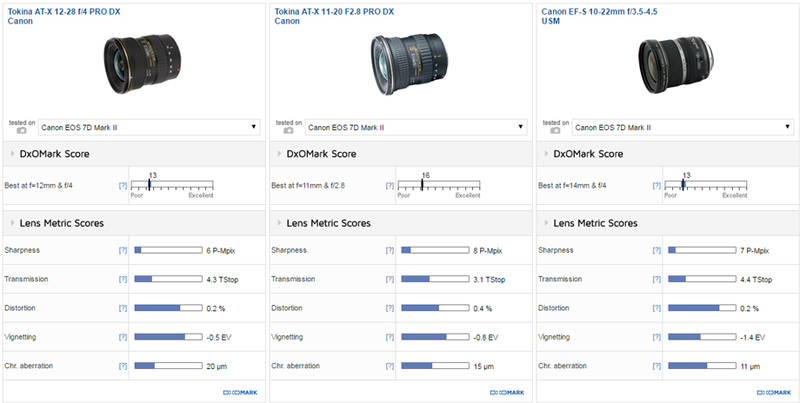 Achieving an overall DxOMark score of 17 points tested on the Nikon D5300, and 13 points tested on the Canon 7D Mark II, the Nikon version is marginally ahead. Both offer similar light transmission of just over four TStops, and like the full-frame version, minimal distortion, which is particularly well-controlled between 16 and 28mm on both lenses. 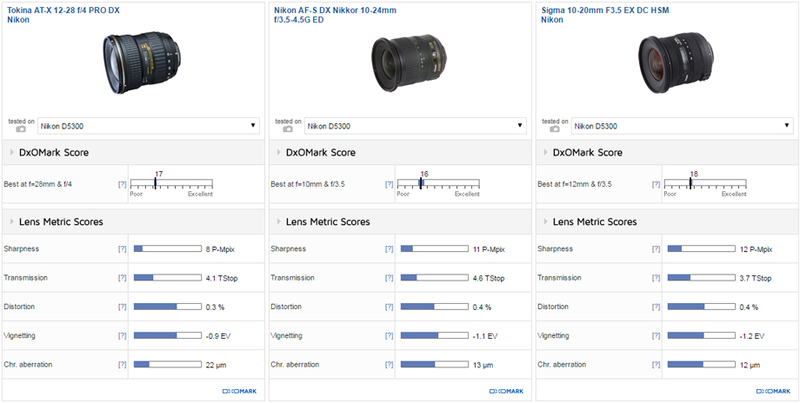 Sharpness scores of 8 P-Mpix for the Nikon and 6 P-Mpix for the Canon are a little down compared to the full-frame equivalent. The Nikon version is at its sharpest between 20-28mm at f/11, with wider focal lengths and faster aperture settings displaying some edge softness. Although the Canon’s peak sharpness of around 60% is a little down compared to the Nikon, resolution is more uniform across the field and more consistent across the focal range and aperture settings. Peak sharpness on the Nikon is achieved at 28mm f/11, compared to 16mm f/5.6 on the Canon, making the Nikon better-suited to long depth-of-field shots. 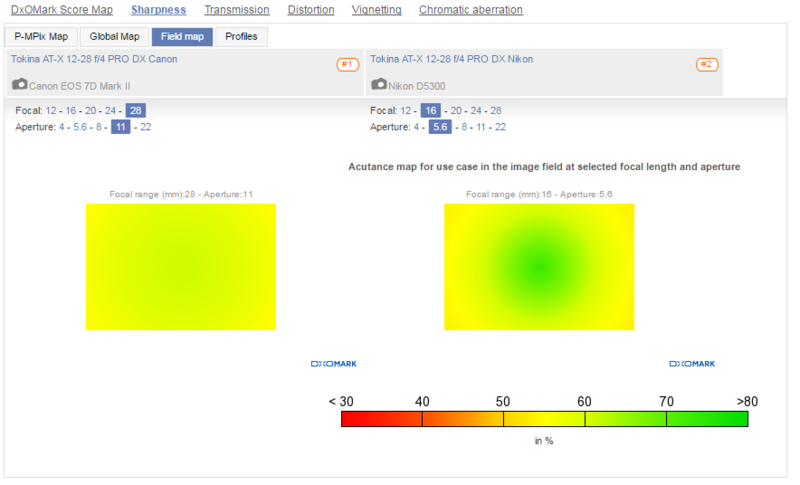 Chromatic aberration scores at 22um and 20um aren’t very strong, with visible fringing an issue at some settings. 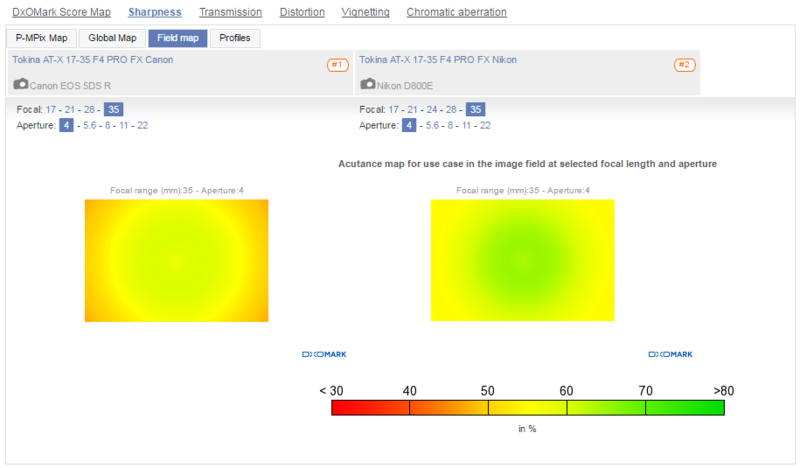 The red on the global map indicates this is an issue for the Nikon, particularly at the wider focal lengths up to 18mm, with well-controlled chromatic aberration limited to the longer end of the focal range at 24-28mm. As with sharpness, the Canon version is a little more consistent for chromatic aberration, with the troublesome red patches limited to the wider focal lengths (12-16mm) using larger f/4 and f/5.6 apertures. 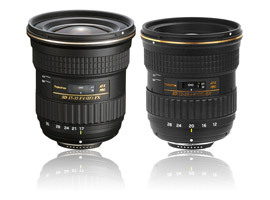 At $449, the Tokina 12-28mm f/4 and Sigma 10-20mm f/3.5 both cost half the price of the own-brand $897 Nikon 10-24mm f/3.5-4.5. While the Tokina boasts the longest focal range, both the Nikon and Sigma are slightly wider at 10mm — equivalent to 15mm on the Nikon APS-C. 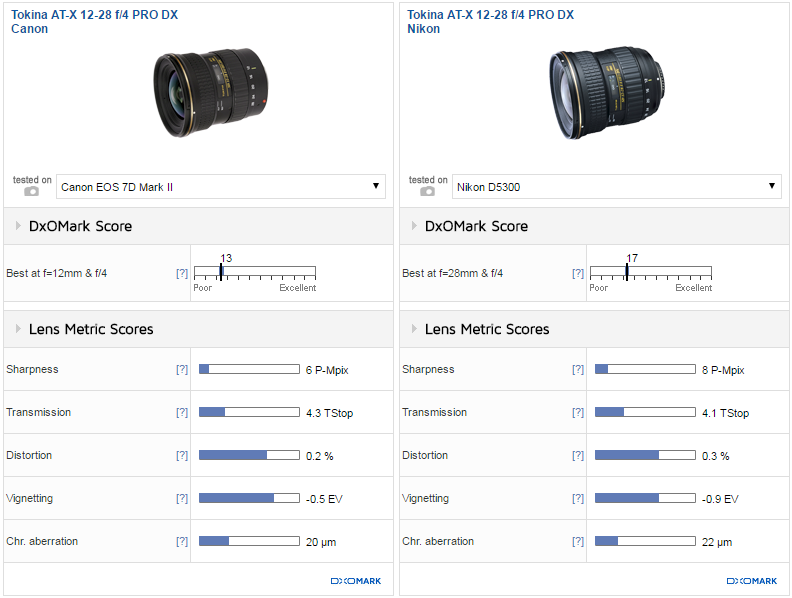 In terms of overall DxOMark scores, the three are close, with the Nikon 10-24mm in third place with 16 points, the Tokina 12-28mm second with 17 points, and Sigma 10-20mm ahead with 18. 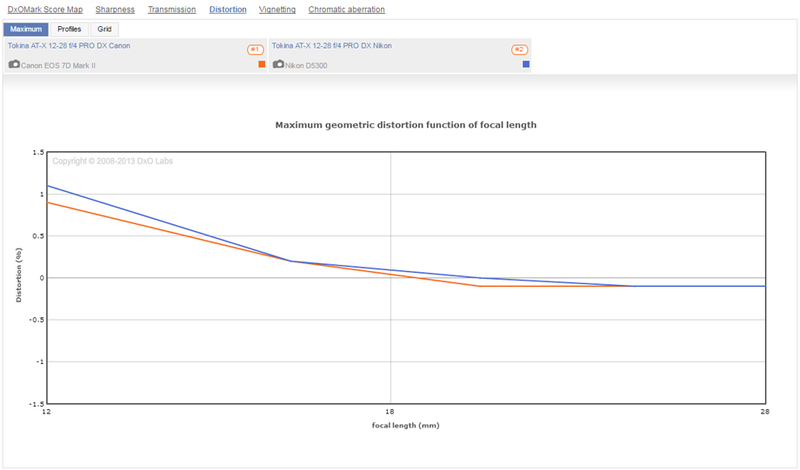 That’s not the full story, however, as there’s more deviation in their individual lens metrics. The faster fixed f/3.5 aperture of the Sigma makes it the brightest of the three, offering over one stop of extra light at 20mm compared to the Nikon at 24mm. The Tokina boasts more consistent brightness across the focal range, however, and despite the Nikon offering a faster maximum f/3.5 aperture at the wider focal lengths, the Tokina is brighter. 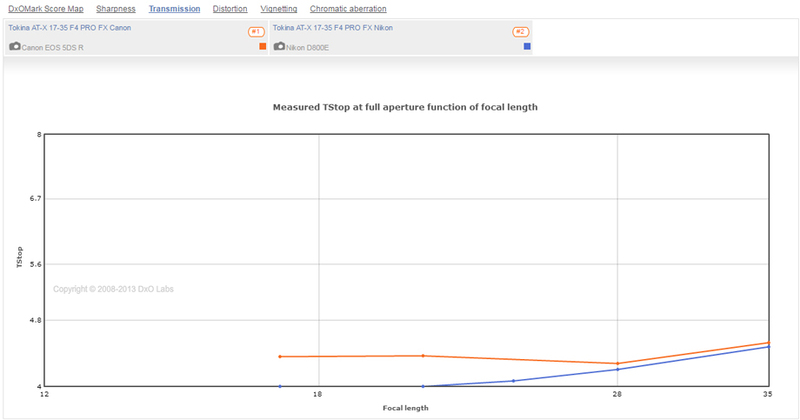 The Tokina lags behind for chromatic aberration, however, due to the heavy fringing at the wider focal lengths already mentioned. The Nikon isn’t perfect at 10mm, with some fringing in the corners at all apertures, but improves quicker than the Tokina, with minimal lateral chromatic aberration between 16 and 24mm. The Sigma offers a more solid all-round performance for chromatic aberration, however, with excellent results at all focal lengths and all apertures, which should be noted for shooting high-contrast or backlit scenes. If sharpness at the wider focal lengths is important, however, the Nikon 10-24mm is the strongest, offering good levels of homogenous resolution at 10mm between f/3.5 – f/11. 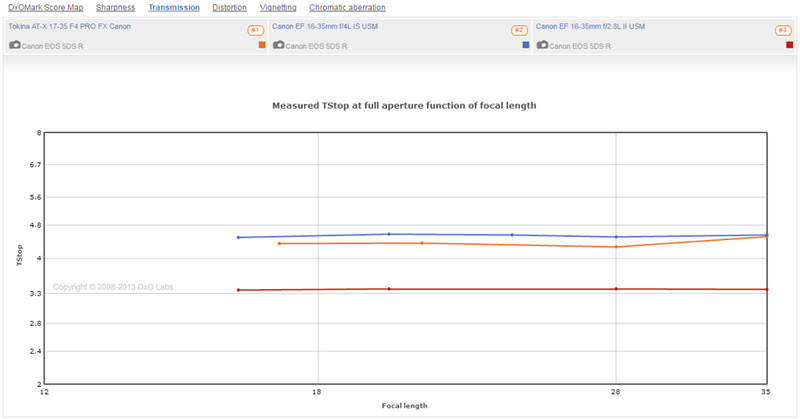 At the same focal length, the Sigma is sharper in the center compared to its outer field resolution, and offers something approaching uniform resolution only at 20mm using mid f/8 and f/11 apertures. For our final comparison, along with the own-brand $649 Canon 10-22mm f/3.5-4.5, we have another interesting Tokina APS-C -format wide-angle zoom in the shape of the $549 11-20mm f/2.8. Boasting a bright f/2.8 maximum aperture, but with a slightly shorter focal range, this alternative third-party Tokina wide-angle comes out on top with a DxOMark score of 16 points, tested on the 7D Mark II, and the best overall sharpness. Just ahead with its sharpness score of 8 P-Mpix, the Tokina 11-20mm is at its sharpest in the center at f/5.6, but is a little more uniform at f/8. 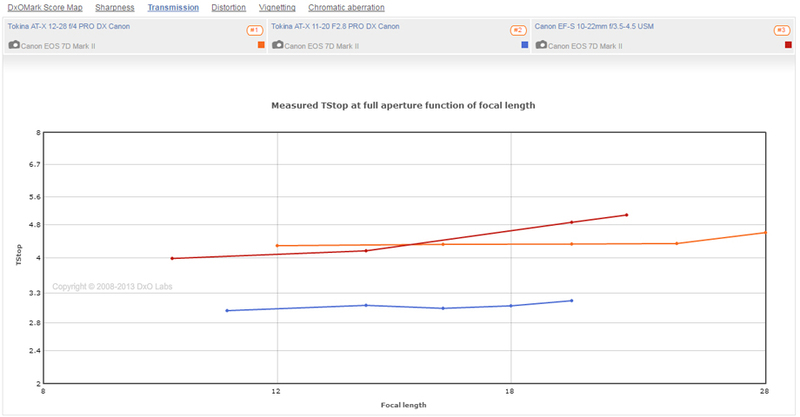 At its widest 11mm focal length, the highest resolution is again captured at f/5.6, and although results are softer at f/11 and f/22, sharpness is uniform at these settings. The Canon 10-22mm also offers the greatest sharpness at mid-apertures f/5.6 or f/8 in the middle of the focal range, and using these apertures at 10mm offers good center sharpness, but some softness in the outer field. Light transmission is far ahead on the Tokina 11-20mm f/2.8, offering around two Tstops’ better transmission than the Canon 10-22mm at 20mm for a brighter viewfinder and snappier autofocus. The own-brand Canon 10-22mm is superior for chromatic aberration, however, which is well-controlled between 16 and 22mm, and at the widest 10mm, fringing is restricted to the very edges of the frame. To be fair, the Tokina 11-20mm is good at these settings, too, and a notable improvement over the Tokina 12-28mm. At $449, both the full-frame-format Tokina 17-35mm f/4 and the APS-C-format Tokina 12-28mm f/4 are good value for the money wide-angle zoom lenses for Nikon and Canon DSLRs. 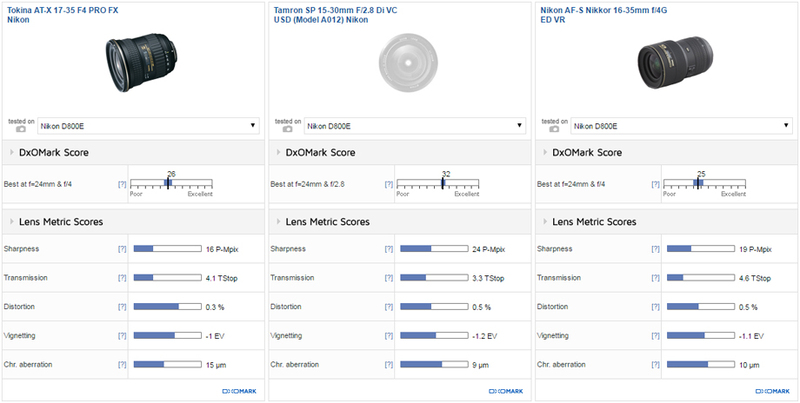 Achieving respectable results in most DxOMark lens metric comparisons, particularly for distortion, these lenses punch a little above their weight. Chromatic aberration isn’t great at the wider focal lengths, but the worst fringing is restricted to the edges of the frame and should be correctable in post-production. If you can live without image stabilization (which many photographers can at wide focal lengths), and without a f/4 maximum aperture (which helps keep the size and weight down), the Tokina 17-35mm f/4 FX and 12-28mm f/4 DX are well worth considering for both FX- and DX-format photographers looking for a wide-angle zoom.